More than 400 journalists’ jobs have been lost over the past 17 months, leaving more areas of the UK with no daily local newspaper coverage, new research has shown. A study by Dr Gordon Neil Ramsay, of King’s College, London, found that 273 local authority districts out of a total of 406 had no daily local newspaper coverage – a ratio of 67pc. There are currently 1,103 local newspaper titles in the UK, according to the findings, which were launched in Parliament last night by the National Union of Journalists. The report reveals a net loss of nine UK regional newspapers between November 2015 and March 2017, with 22 titles closing and 13 launching. It also highlights 30 instances of job cuts announced over a 17-month period involving the loss of 418 jobs. In addition to the job cuts, reorganisations affected a further 83 jobs, and there were six newspaper office closures, with journalists often being moved long distances away from the communities they serve. 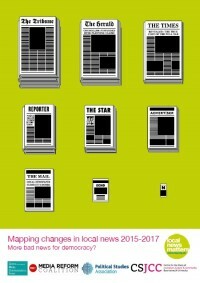 The report, entitled Mapping Changes in Local News 2015-17, argues that the BBC deal for 150 new local democracy reporters will fail to offset the loss of more than 400 journalists from the largest publishers during the same period. It says the £8m to be spent annually on this scheme will be taken out of the publicly-funded licence and represents a fraction of the combined operating profits of the largest local publisher. Acting NUJ general secretary Seamus Dooley said: “Journalism is a pillar of democracy and this survey should be of major concern to anyone who cares about local, regional or national government. “This survey points to a deep crisis in local and regional news provision. “There is an urgent need for government and media organisations to halt that decline, to examine ways of developing sustainable media business models operating in the interests of democracy and the public interest. on top of this there is the problem of once popular regionals that covered a huge area well stripping their coverage outside their main city area so that it barely exists. Which might explain why so many of the local weeklies are so poor too. Competition is a good thing and a lot of weeklies do not have it now.